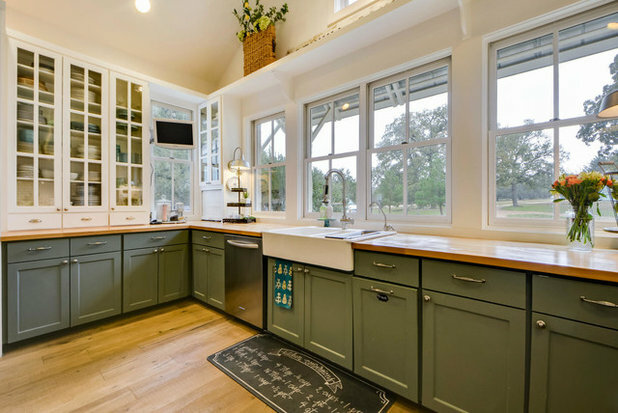 With appliances, cabinets, furniture and more commanding attention in the kitchen, these rooms can look overly busy. That’s why the tendency is to keep the materials and colors simple. 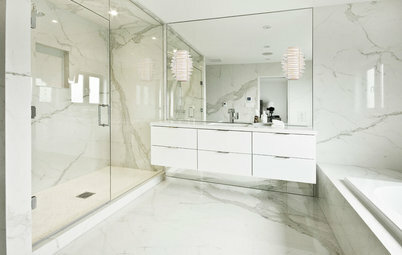 But when done right, mixing materials, colors and textures can create a visually stunning and harmonious space. 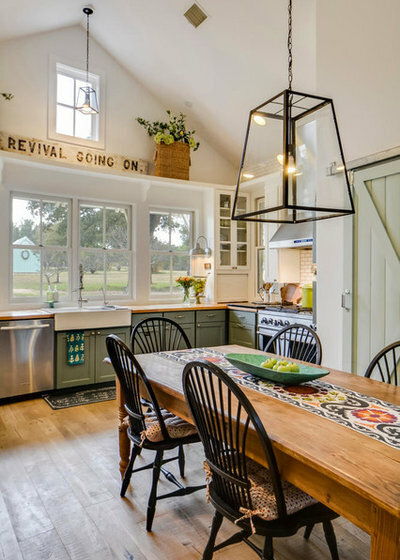 Just take cues from these two great kitchens. 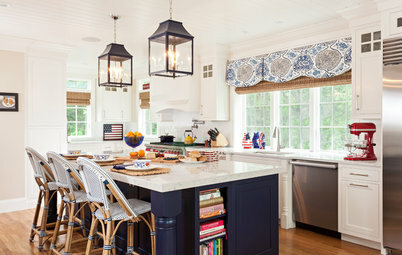 Material mix: “Textures bring a cozy feel, and the kitchen should be one of those cozy rooms full of great textures and great cooking,” says designer and homeowner Jeanette Forney Van Wicklen. 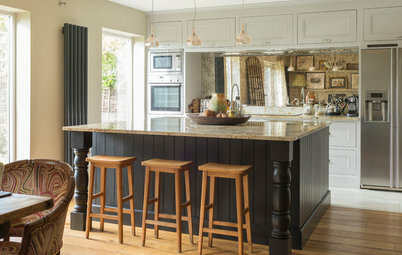 Her two large black dogs had dirtied her original all-white kitchen cabinets by constantly brushing up against them, so when it came time to replace the wood floors, she took the opportunity to repaint the cabinets a darker olive-gray. “It’s more user-friendly,” she says. She replaced dark black-green soapstone countertops with butcher block from Ikea. 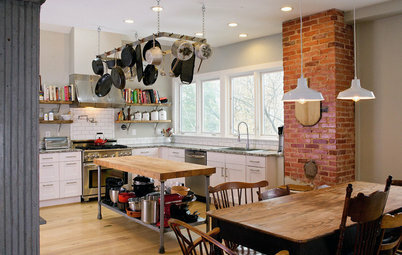 “I love the soapstone look, but it required more maintenance,” she says. She kept a piece of the original soapstone and used it to the left of the stove. 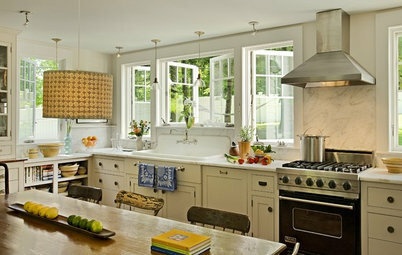 There’s also a section of Carrara marble for baking to the left of the fridge in another part of the room. Plan of attack: Van Wicklen began with the paint color, which she based on coffee mugs that have a pattern of grays, olive, kiwi and white. Next came the floors, countertops and lighting. Why the design works: The open plan makes a great entertaining space and allows the homeowner to switch from a dining table in the center to a large island, which she had before. “It works great either way,” she says. “Uh-oh” moment: Van Wicklen had replaced the original tile floors with longleaf pine after moving into the home. A plumbing leak ruined the new floors, so she had to replace them again, this time with hardy oak. “They’re very user-friendly, great with dogs — scratches don’t show, and the color masks any country-muddy paws that come in,” she says. Material mix: “The overarching focus for the materials selected was to combine the cool, calm colors of the ocean with low-maintenance products essential for casual beach living,” says designer Jason Ulm. Stainless steel forms the perimeter countertops, while white quartz covers the island. 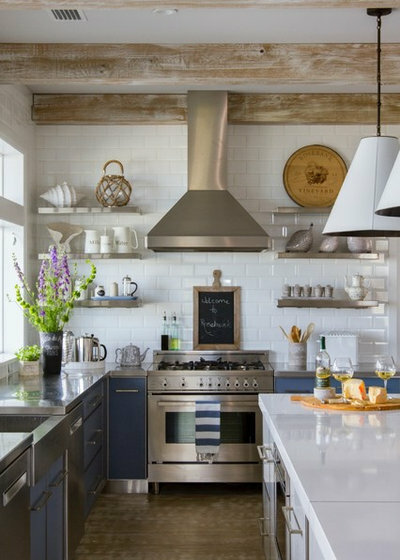 The cabinets are stainless-steel-framed glass panels from Bishop Cabinets, painted a bluish gray on the perimeter and brilliant white on the island. 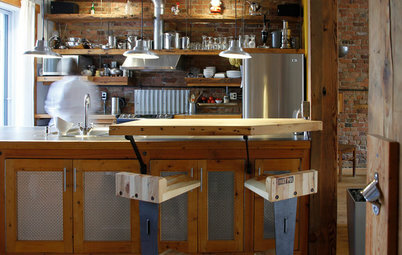 Ulm’s carpenter built the beams out of white oak planks that a local faux finisher then distressed. 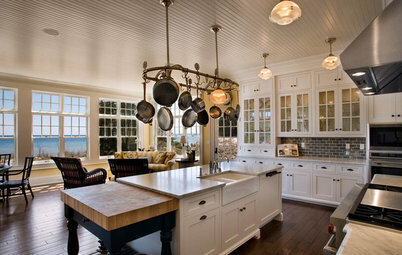 Homeowners’ request: A hassle-free kitchen that reflects a contemporary and clean style fit for an oceanfront home. Why the design works: The space flows well to the living and dining rooms, while the oversize island can seat six people with ample room for others to still move around it. Antiques displayed on steel shelves add warmth and keep the space from feeling too sterile. Who uses it: A couple and their five kids mostly enjoy coffee, tea and breakfast here while watching the morning sunrise over the ocean. 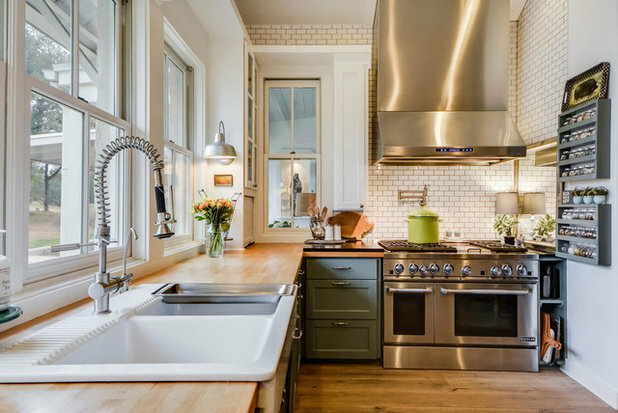 New This Week features designs from projects most recently uploaded to Houzz. Have a great project? 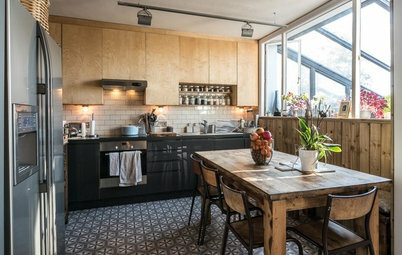 Here’s how to share your photos on Houzz.